The housing market has turned upside down. In January 2009, the median home price is San Francisco Bay area was $300,000 down from $550,000 in January 2008. The developers of San Jose high-rise condominium towers begin to offer tasty incentives for brokers and clients like fixed-rate financing, tax credit, HOA paid for two years. 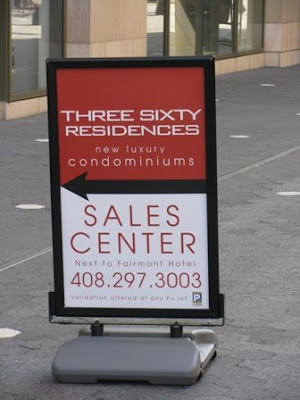 Three Sixty Residences San Jose is a 23-story tower containing 213 condos. The price for 360 San Jose condos is from Three Sixty Residences from $500,000. 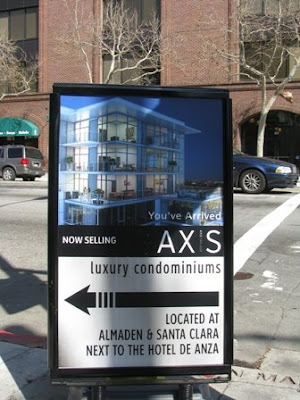 Axis San Jose is a 23-story tower containing 329 condos. Axis units are priced from $400,000 to $2 million. 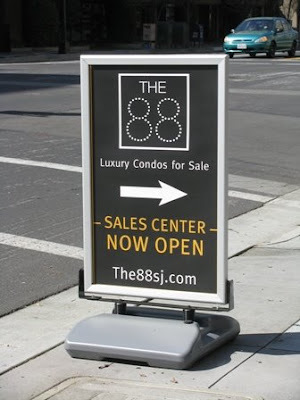 The 88 San Jose is 23-story tower with 197 condos in phase 1 and possibly Safeway underneath. The 88 condos are priced from $490,000. One East Julian San Jose is just 43 unit condominium complex. 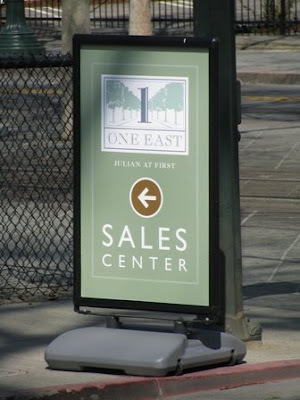 One East Julian condos price is from $499,000.